A new author for me and I have marked the first two stories in the series to my TBR shelf. I found the main characters well developed. The theater setting did not do much for me. The scenes at the Windjammer restaurant was much better. Until I got the characters straightened out it was slow going but I am glad I did as I feel it was unusual in a cozy. The main character and the Police working more less together. 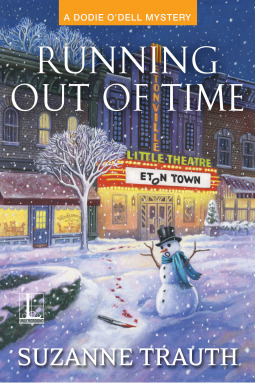 In this book, Dottie O’Dell is supplying great the intermission of the Eaton Little Theatre. It is dress rehearsal when a bloody body is found in one the setting of the play. Dottie sees Sally, an actress fleeing the area with bloody. Against the Police advice, Dottie decided to help Sally. Dottie going against her boy friend’s, the Police Chief, is trying to help Sally. Dottie takes several turns before she manages to touch base with Sally again. Disclosure: I received a free copy from Lyrical Underground for an honest review. I would like to thank them for this opportunity to read and review the book. The opinions expressed are my own. This entry was posted in Books, Uncategorized and tagged cozy mystery, Dottie, Eaton, Suzanne M. Trauth, theater murder. Bookmark the permalink. I think I read the first book. You make it sound so good that I looked it up in NetGalley to see if it was still available. Two of her books show up in the “previously” category, but I don’t see this one anywhere. It was archive Oct 13. I think I requested it for a new author and something to read. Nice surprise that I like it.